Quickly chop or dice vegetables and ingredients for homemade salsa, egg salad or toppings for ice cream sundaes! 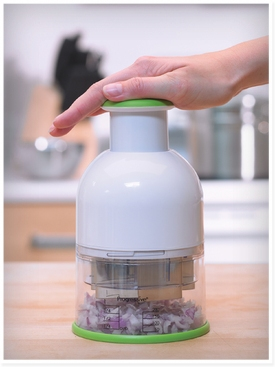 With the Progressive Food Chopper itÕs easier than ever. The extra large size allows for larger foods to be placed inside the Food Chopper with less pre-cutting and handling. Ideal for fruits, vegetables, nuts, herbs and chocolate. Plunger style operation makes for easy one-handed use. Top of plunger features a non-slip soft touch coating. Removable cover included for use with or without a cutting board. Includes printed measurements up to 1 cup or 200 ml of chopped food. Easily disassembles for quick clean up.